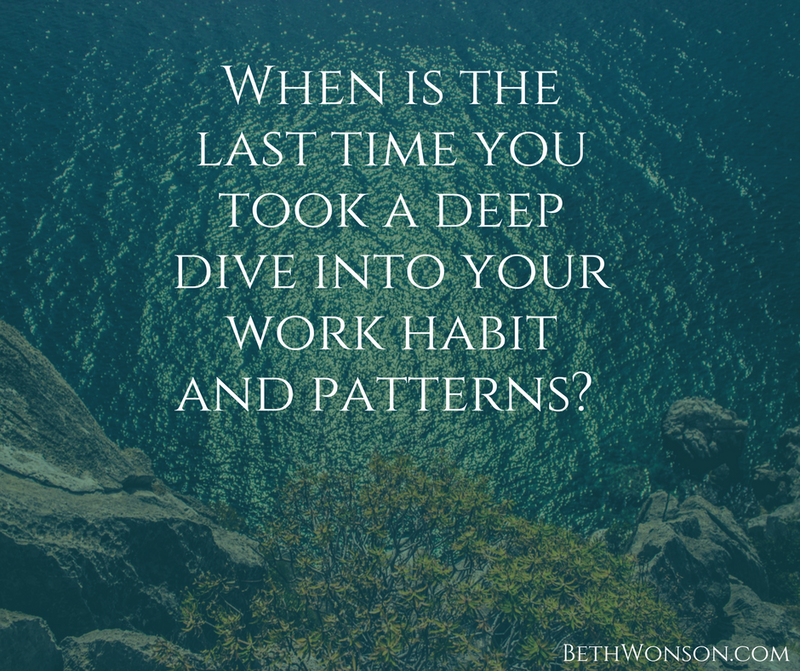 When is the last time you took a deep dive into your work habit and patterns? When did you consider what you do each day to see how it really aligns with what you most need to get done to achieve your goals? Most of us get so busy that we forget to stop and take a look at what, how, and why those tasks are taking up our time. We just march on, sometimes complaining, that there just isn’t enough time in the day. So here’s some help! At the end of this email is a simple tool to walk you through taking a look, allowing you to make a deep dive so you can start swimming easier and faster. This is my gift to you. But first let’s explore some of the basic reasons why and how we end up so bogged down. There are three categories of resources that we have available to spend each day. One category is made up of financial resources. The second category includes our strengths and skills. And the last is the resource of time and energy. Of these resources, time is the only one that is truly non-renewable. Once time is spent, it is gone. Shockingly, time is also the resource that we spend the least amount of time evaluating how we spend it. Business owners do a budget analysis at the end of each year to monitor where their money went and how to make improvements. We try to find ways to make more money. We strive to level up in our career or business by expanding our skills, improving what we bring to the table and maximizing our strengths. And most employees participate in at least one annual performance review – an evaluation of what they want to achieve and how they want to improve upon their skills and strengths. But how often do we intentionally assess the only resource that we can’t get more of? Time? How often do we take a deep look at how we are spending that which can not be replenished? For most of us the answer is not often or may be not ever. I have been working with a business owner whose business has grown significantly and he is focused on leveling up again. He has hired a competent team to support him in the achievement of his goals, but he is exhausted and bordering on being burnt out. Why? Because he has done many of the same tasks in the same ways year after year. He still buys the story that it is easier to do it himself than it is to train someone to do tasks to the standard he wants them done. He wastes so much time doing things that could easily be delegated. When I ask why, he tells me that he just doesn’t want to spend the time training someone to do something that he can do pretty quickly. But if it is a repetitive task (every day, every week, every month), the two hours he will spend training and documenting the process will have a payoff over time that is similar to compounded interest. That is return on investment! Every year I prepare my Easter ham the exact same way my mother did. I cut an inch off the end of the ham and then place it in the pan for baking. I toss that inch away. One year I asked my mother what the purpose of cutting off the inch. I knew it had a reason because my mom’s ham always yummy. My mom responded saying, “I’m not sure. My mother always did it that way and her ham was great”. I checked in with my grandmother and her reply was, “My pan was an inch too short”. When is the last time you took a look at all the tasks you do to see if how you do them may be a case of “my pan was an inch too short” syndrome? Ask yourself these questions: Is the task still necessary? Is the process efficient and effective? Am I the right person to be doing it? Has there been any technological advances that may be able to aid in how I expedite the completion of the task? Brain based research tells us a great deal about when our brains are best suited for which tasks. Big complex tasks are best completed when your brain is hydrated and rested. More rote tasks that require less thinking are better suited for when you are a bit more depleted. Rate each task in terms of complexity, brainpower and if it requires you to learn new skills or how to use new tools. Then think about how the task feels – Does it feel like climbing a mountain or just going for a window-shopping kind of stroll? If it feels more like climbing a mountain, then schedule it for when you are rested and hydrated. Schedule some prep time in advance to make sure you have all your tools ready before you begin (a work plan, a clean desk, research documents, ink in the printer, etc.) and begin. If the task feels more like a stroll, and doesn’t require too much brain power or energy, then schedule it for a time when your energy may be a bit lower like late afternoon. Our brain is wired for cognitive shortcuts- thinking patterns that are designed to save us time in problem solving. This is called a heuristic technique which simply defined is a process, while not prefect or optimal, may suffice to meet a short-term goal. Once we become aware of the heuristic techniques our brain uses to come up with short cuts to problem solving, innovating, collaborating and more, we can recognize the pattern and interrupt it. When you have the thought, “I’m going to keep trudging along trying to make this work because I’ve already invested so much time”, you can interrupt the pattern and commit to take a deep look into the possibility that it is time to give up on the way you are working now. Yes, taking a deep dive into evaluating how, why and when we do the repetitive tasks will cause discomfort. Why? Because you will need to be objective, analytical and in some cases come to realize that what and how you’ve been doing things needs to be switched up. And all of that takes time that you could be working. But the reality is that growth comes through discomfort.